European retailers were sold out of the new iPhone 3G before stores in the US even opened on Friday, thanks in part to strong marketing from Apple's mobile partners. The initial sales surge not only blew through stores' inventory but also delivered a knock-out punch to Apple's iTunes activation servers. 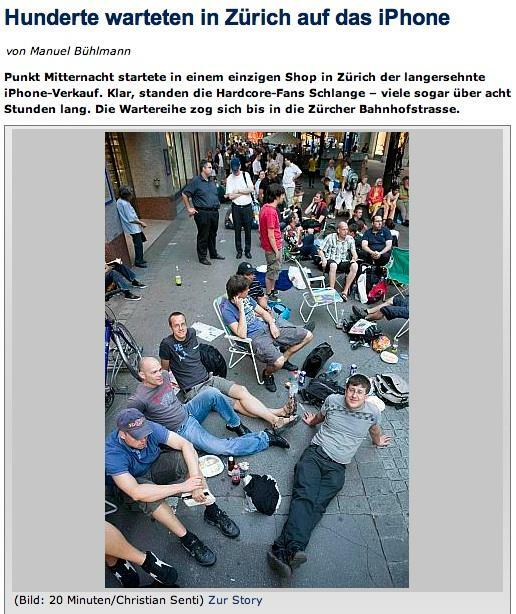 The Swiss daily newspaper "20 Minuten" reported that hundreds waited in line for hours in Zürich in front of the central Swisscom store. The mobile phone provider opened 100 of its retail stores at 6:30 AM and served snacks and water to those waiting in line. In Bern, Swisscom's main shop in the Christoffel shopping center was sold out of 16 GB iPhones by 8 AM, and was sold out of all iPhones by two in the afternoon. An employee reported that the store had received an initial allotment of 3,000 iPhones. There are over a dozen other Swisscom retail stores in the Bern area, and all were sold out on the first day. Orange didn't open its stores as early in the morning, but was similarly sold out of all iPhones by early afternoon as well. Several other retail shops in downtown Bern, including Mobilezone, Apple Specialist retailer Data Quest, and the Globus department store, which hosts a Swisscom store inside, were all busy selling the new iPhone to slow moving lines three customers deep all morning. All sold out of their inventories by early afternoon, although a few stores had held a unit or two for customers who had called in to reserve one. 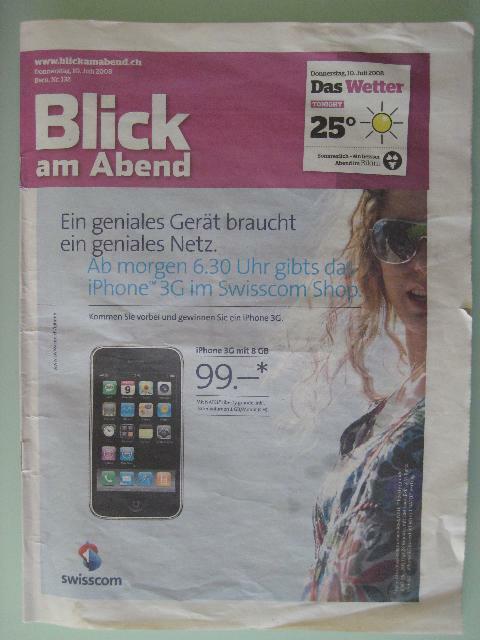 The night before the launch, Swisscom paid to wrap the daily paper "Blick am Abend," (below) with an iPhone ad promoting the 8GB iPhone for 99 Swiss Francs ($99 US) with the purchase of a two year, 55 Swiss Franc ($55 US) plan, which includes access to 1100 WiFi hotspots. Swisscom is also selling the iPhone 3G 8GB/16GB without a subscription plan for 519/619 Swiss Francs ($519/619 US), although the unit is still locked to Swisscom for service. Enterprising hackers will likely work around the SIM lock soon, making the Swisscom pricing one of the most attractive deals in Europe. 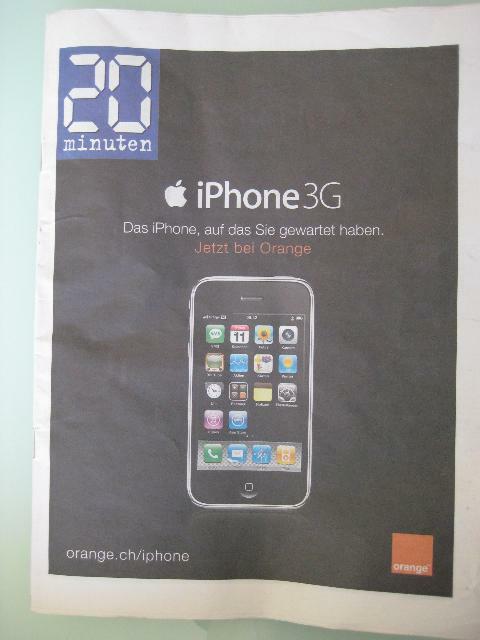 On Friday, Orange wrapped its own offer over 20 Minuten: the 8GB iPhone 3G for 99 Swiss Francs ($99 US) with a two year contract, although the contract price is higher at 99 Swiss Francs ($99 US) per month. 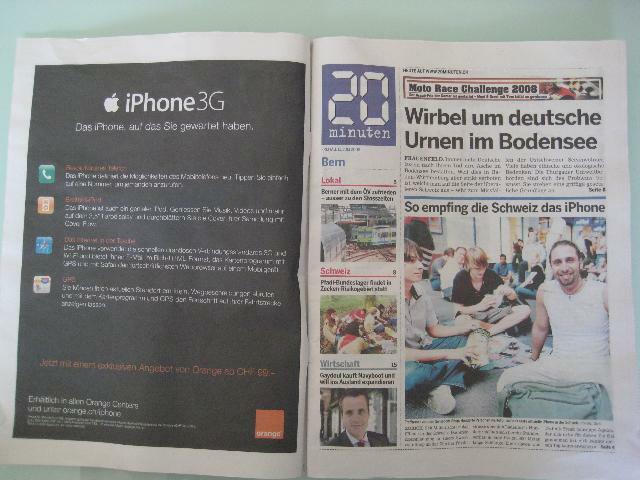 Without a rate plan, Orange is selling the iPhone 3G 8GB/16GB for 759/859 Swiss Francs ($759/$859 US). Orange also includes access to 1,500 WiFi hotspots. 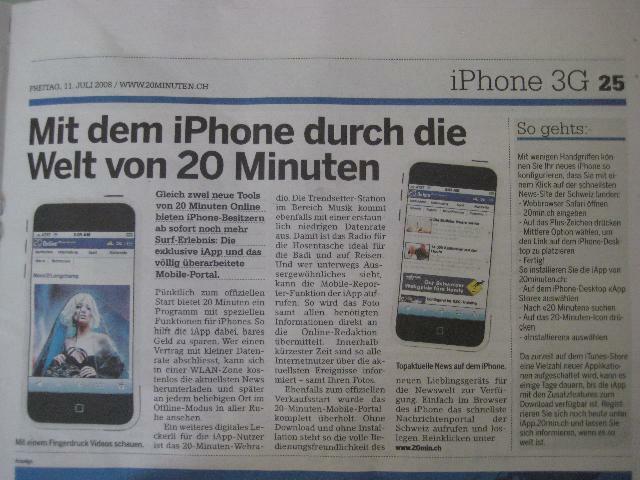 In addition to the service providers' literal newspaper coverage with advertisements, the papers themselves were reporting extensively on the launch, with 20 Minuten touting its own iPhone app featuring a news reader and a video portal. The paper also maintained an online section devoted to the iPhone launch for months. 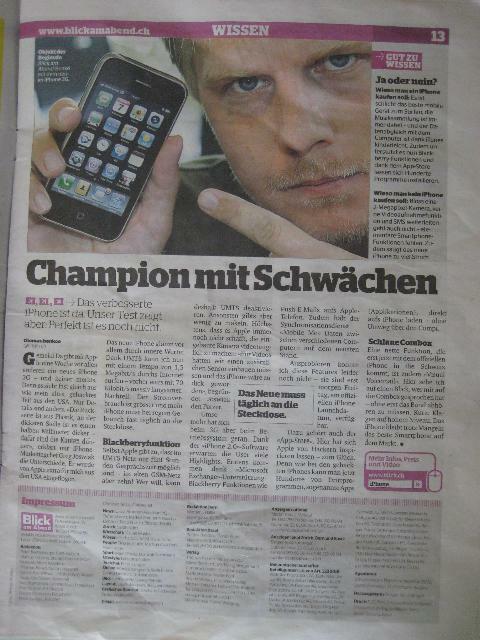 Blick reviewed the new iPhone 3G as being, despite a few flaws (including its weak 2 megapixel camera, lack of video recording, and inability to forward SMS) "the best smartphone on the market." As reported earlier, the top three Swiss mobile operators have already noted 42,000 iPhones on their networks in the year prior to the official iPhone 3G launch. Retailers who sold out their initial inventory on the first day expected additional iPhone 3G shipments within the week. Supplies of the new iPhone appear to be less constrained in the US, but sales and activation delays still resulted in long lines. Brisk sales of the new iPhone model, along with iPod touch sales being promoted by mobile carriers (such as the Swiss Sunrise) that are not selling the iPhone itself, promise to build strong support for Apple's new mobile App Store platform. However, the strong surge of demand on launch day has resulted in big problems for both mobile carriers and for Apple. Mass activations of the new iPhone 2.0 software have temporarily knocked out the company's iTunes servers, preventing new customers and existing iPhone users from completing their iPhone 2.0 software installations and rushing to iTunes to buy the new mobile apps. The blow to Apple's iPhone App Store service capacity comes just as the new MobileMe service is recovering from its initial transition problems. Originally scheduled to come online yesterday, the MobileMe push messaging service and online suite of apps has just started to become broadly available midday today.